P.S. This is Part II of Rebecca’s important series on understanding Safety Data Sheets. Find Part I here. Greetings! Welcome to Part II of Safety Data Sheets for Theatre Artists. When we parted last month, we had just finished the first half of this tutorial on how to extract useful information from the safety data sheets that come (or don’t come) with your materials. This month we’ll dive right into the second half, and talk about some of the most useful physical and chemical properties you might see, and how they can be helpful in determining the hazards of a material. SECTION 9 - Physical and Chemical Properties: Here are a list of some of the most common properties you might see, and why they would be useful. This isn’t meant to be an exhaustive list; that would never fit in my word limit. But these are some of the most frequent and/or most helpful. Unfortunately, for things that are mixtures, which most theatrical materials are, these are very often not determined and lots of lines will just say “no data.” In this case you can get some information by looking up the properties of the various components, but keep in mind that the other ingredients will affect those properties in unknown ways. Physical state, color, odor: helps you know what the material is, and whether it’s in good condition. Odor threshold: Rarer than a unicorn sighting, if this information is there, it will tell you if you should be concerned if you can smell the material. You can compare it to the exposure limit. pH: This will tell you how acidic or basic the material is. Remember your middle school science class – the scale goes from 0-14, 7 is neutral, acids are less than 7, bases are greater than 7. As a rule of thumb, you can consider anything less than 4 or greater than 9 as likely to be irritating or corrosive to skin. However, pH is only one of several characteristics that may cause a substance to be irritating or otherwise hazardous, so don’t let a neutral pH lull you into thinking it’s harmless! Melting or boiling point: mostly useful to know how hot the material can get before it starts vaporizing. Things with a particularly low boiling point may present an extra inhalation hazard. Flash point: The lowest temperature at which vapors of the material will ignite in air if there is an ignition source (like an electrical spark, or someone lighting a cigarette). Autoignition temperature: The lowest temperature at which the substance will self-ignite, without an external ignition source. The likeliest place in theatre to see something with a low autoignition temperature will be pyrotechnics, which should always be left to a highly trained pyrotechnician. Lower and upper flammability limits (LFL and UFL, respectively): This will tell you what concentration of the air must be comprised of the material’s vapors to have a fire, if there is an ignition source. Think of it in terms of the fire triangle: to have a fire, you need fuel, oxygen, and an ignition source. The fuel is the material, if it’s flammable or combustible. If you get enough of it in the air (up to the LFL) and there’s an ignition source (see “Flash Point”), it can be set on fire. If you get too much of the chemical in the air (above the UFL), it may push enough oxygen out of the way that a fire won’t be able to start, even if there’s an ignition source. However, if you exceed the UFL, you’re a) probably looking at a hazardous health situation from an inhalation standpoint, and b) once the environment starts to air out, the concentration will have to drop into the flammability range before it all disperses, and you won’t know when that happens. Best to stay waaaay below the LFL and not have to worry about it. Most of the cases I’ve heard about where the UFL was exceeded involved an overnight gas leak and were not part of expected working conditions. If you’re getting into that sort of situation in normal theatrical operations you are doing something very wrong and should stop immediately and consider your life choices. Degradation temperature: The temperature at which the chemical components of the material begin to break down and the substance starts to release the things listed in Section 10. Vapor pressure: This handy measurement is supposed to tell you how volatile a material is, or how badly it “wants” to change from one state to another (for our purposes, almost always from liquid to gas). Things with a high vapor pressure are called volatile, and their molecules have a much easier time leaping off the surface of the material into the environment’s atmosphere. This property is why acetone, for example, is so much easier to smell than, say, water-based paint. It’s much more volatile, has a higher vapor pressure, and gets into the air much more easily. It can be very confusing. It’s even more confusing once you throw temperature into the mix. Generally, as temperature increases, so does pressure. So anytime a vapor pressure is reported, it’s going to be the pressure at some specific temperature, usually either 0 or 25 degrees Celsius. A good way to try to use the vapor pressure to inform your shop practices is to compare the material’s vapor pressure with that of water. The internet has a million and three references for water’s vapor pressure at various temperatures. This site has a nifty calculator that you can use for Celsius or Fahrenheit temperatures and choose your pressure units in pascals, millipascals, bar, millibar, atmospheres, and millimeters of mercury, which is pretty good. I haven’t found one yet that has all of them, but it probably exists. If you find it, let me know. Molecular mass or molar mass: This property tells you how big the individual molecules of the substance are, in grams per mole. A lot of the time things with a low molecular mass (less than 5000 g/mol—a very rough estimate) are extra reactive and have more severe health effects than things with high molecular mass (think hundreds of thousands of g/mol). SECTION 10 – Stability and Reactivity: This will tell you how reactive the substance is under various conditions. This concerns physical reactivity—things like “water reactive” or “ignites on contact with air.” This section should tell you if there are particular classes of stuff it shouldn’t be mixed with or stored near, and whether the vapors have a tendency to stick around and make a fire hazard. It will also tell you what the potential hazardous decomposition products are, meaning “what might be released if this thing burns.” This can be particularly relevant to theater craftspersons because it is entirely conceivable that we might be using pyrotechnics, want to burn something onstage, want to partially burn a prop or costume for an effect, or be using heat as a construction method—think carving foam with a hot knife or wire. You can’t always rely on this section, though—sometimes they might only tell you the ideal decomposition products under conditions of complete combustion, which do not usually happen outside of controlled laboratory conditions. SECTION 11—Toxicological information: This section is supposed to contain the results of any toxicity testing that has been done on the substance, and how those relate to some basic categories of health effects: skin corrosion / irritation, eye irritation / damage, respiratory irritation, target organ effects, carcinogenicity (causes cancer), mutagenicity (causes genetic defects), reproductive toxicity, and skin or respiratory sensitization. It should tell whether these effects are acute (immediately noticeable) or chronic (develop gradually over time), whether they happen after single or repeated exposure, and what exposure route (inhalation, dermal, or oral) they cause these effects through. For example, some things are hazardous if you breathe their vapors or dusts, but not hazardous if you get them on your skin. I say supposed to because SDSs are supposed to have all this, but a lot of times they do not, and will just say “no data available.” “No data available” does not mean “safe.” Sometimes you can glean information by looking up toxicology data of the various components of a mixture. To be conservative, you can assume that any mixture is equally as or more hazardous than its most hazardous component. There is not very much information that exists on how mixing chemicals together changes their toxicity. I recommend taking the precautionary principle for this concept, and treat anything for which you don’t have proof of harmlessness as moderately to highly toxic, and handle it accordingly. SECTION 12—Ecological information: This section will tell you how hazardous the substance is to the environment, through various measures and tests. Things that are toxic to aquatic life, bioaccumulate, or accumulate in soil or water should be treated as hazardous waste and not released outside (i.e. poured down the drain, used out on the loading dock without containment, etc). SECTION 14—Transportation information: This section will tell you if there are any regulations restricting movement of the material over public roads (The only obvious relevancy that comes to my mind for this section in theater is for touring shows that require a selection of materials to travel with them, like a touchup kit, or consumable props or set pieces or something). 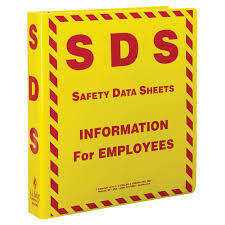 However, there are few EHS topics I know less about than transportation regulations, so if you have a concern in this area I recommend contacting your vendor for the material through the number at the top of the SDS—they will have had to comply with the regulations to get it to you, so they should know how the regulations apply. SECTION 15—Regulatory information: This will tell you about any regulations (other than Department of Transportation, which lives in Section 14) that apply to the material. Usually these apply to cases where the company is manufacturing something using the material, rather than just using it as an end user. However, this is also where you’ll find out about components listed on the California Prop 65 list (carcinogens and reproductive toxins), and the various state Right-to-Know laws that may be more stringent than the federal ones. Apart from the obvious usefulness of knowing the hazards of the components, this information is helpful because it can sometimes reveal ingredients that the manufacturer did not tell you about in the ingredients section. This has to do with the differences between the required reporting percentages of the ingredients—the federal rules may have higher reporting cutoffs than the individual states, so something might be present in such a tiny amount that it doesn’t have to be reported up in Section 3, but still has to be reported in Section 15. SECTION 16—Other information: This section is a catch-all for anything else the manufacturer thinks they might be supposed to tell you but isn’t sure where else to put. Things commonly found here include: exposure limits, H-codes, date of compilation or revision of the SDS, HMIS or NFPA ratings, disclaimers. There you have it, folks. You’ve finished reading your SDS, and if you’re lucky, you have some information about the hazards of your material. At this point, think about what you do and don’t know about the material, and plan your use of it accordingly. My personal recommendation is to err on the side of caution, and imagine yourself explaining what went wrong to an OSHA inspector in the worst-case scenario. The more foolish you would feel in this situation, the more you should probably not do the thing you’re planning.